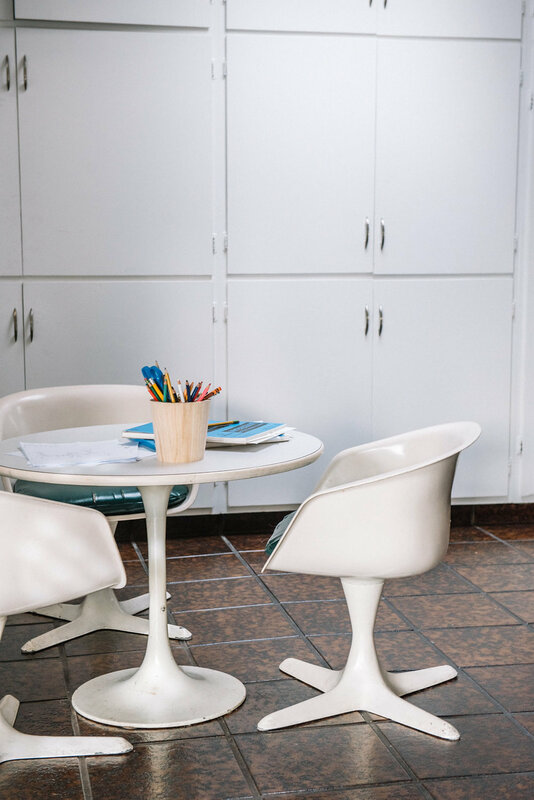 Welcome to Mama Cribs, a Fashion Mamas Journal series where we shine a light on the gorgeous homes inhabited by inspiring mothers. Step into Neve & Hawk designer Kris Galmarini's 1950s-built home and you might feel like you're settling into a dreamy vacation in Joshua Tree, the hot weather town known for its boxy abodes and desert-dwelling bohemians. An effortless, lived-in fusion of midcentury modern lines and Scandibo-meets-Southwest influences, Galmarini's self-described "simple, laid back, and lounge-ready" house is actually tucked away in the creekside commune of San Anselmo in Marin County, over 500 miles away from Southern California's High Desert. "When we discovered San Anselmo, we knew it was for us. It is really a magical place where kids can be free in a way we were growing up," Galmarini tells us. Brimming with Hollywood history — it was a silent film capital in the early 1900s and resident and director George Lucas dreamed up Star Wars there — and with roots in the railroad industry, the charming city turned out to be the perfect place for the Fashion Mamas San Francisco member to plant West Coast roots for her family of five. 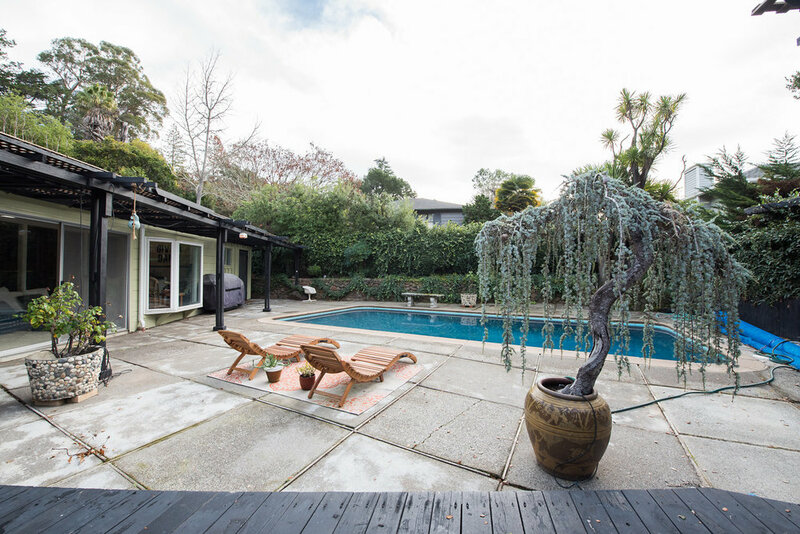 A job opportunity in San Francisco saw the clan relocate from South Carolina, and as the Galmarinis' print-filled space suggests, they had little trouble settling into the Bay Area. Two years ago, Galmarini (who runs Neve & Hawk with her husband, Bob) opened a flagship store for her brand in downtown Sal Anselmo — and last month, the boutique reopened to include the Alongside Collective, which houses mama-led labels Amae and Tosan (the latter of which is also owned Fashion Mamas member Surya Grover). 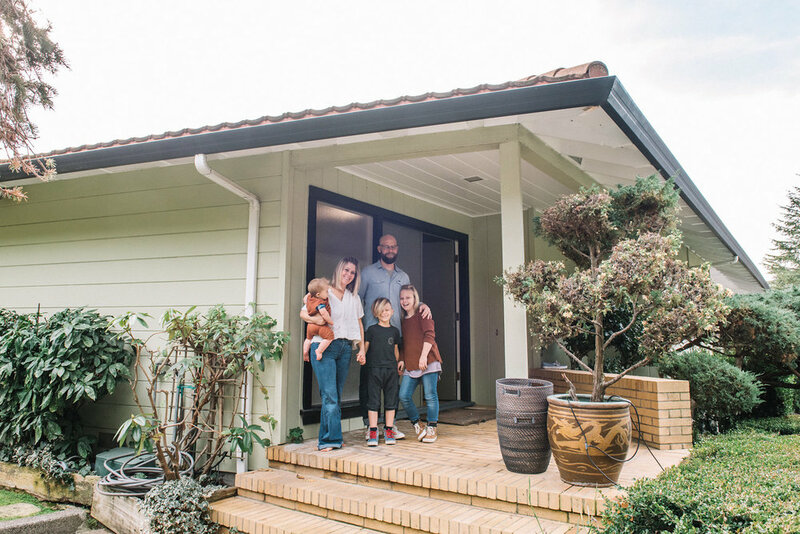 Galmarini welcomed us into her Bay Area crib, where we captured her family as they lounged together at home. 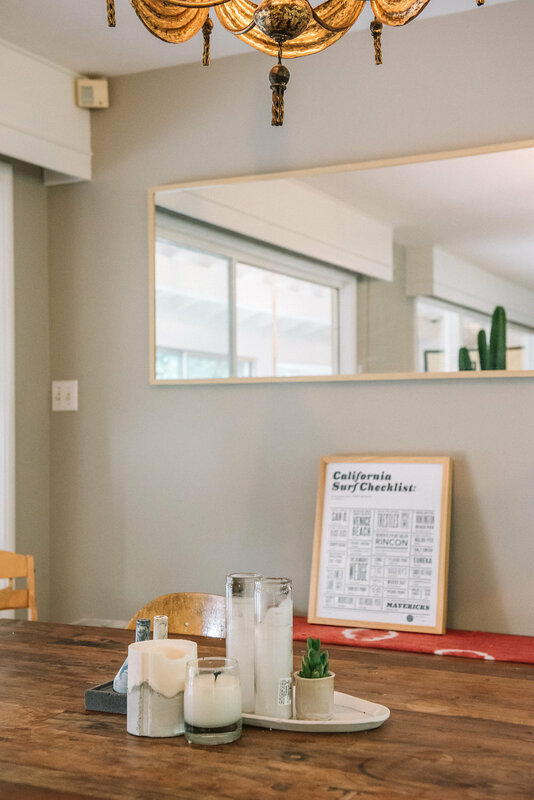 Here, she gives us a peek inside her sun-drenched space — from her ultra-comfy living room to the bohemian modern sun room that has its own bar — and reveals where she shops for home decor, what she loves most about her neighborhood, the 10-minute ritual that her family can't start the day without, and much more. 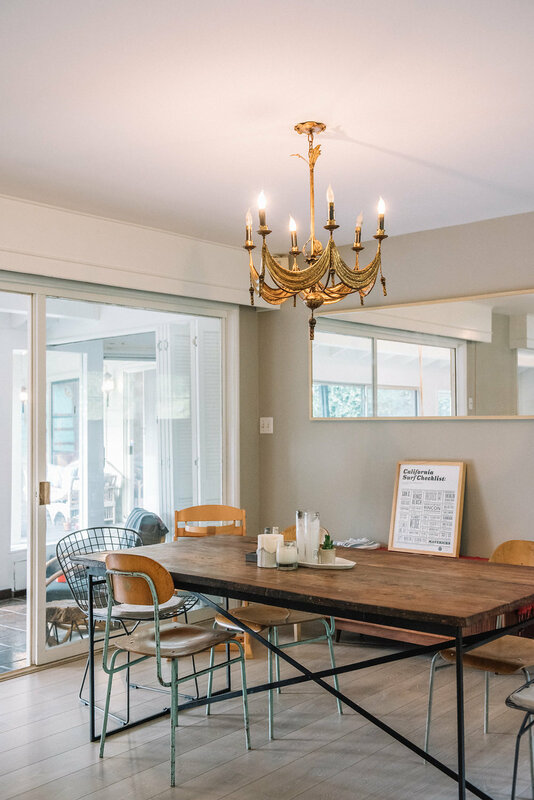 Read on below, and scroll down to see more photos inside her stylish haven. Interview by Nara Walker; intro written by Fashion Mamas Journal editor Danielle Directo-Meston. What do you do and who do you live with? I am a clothing designer and store owner of label neve | hawk. We make children's and women's clothing, a tad bit of men's [apparel], and some home goods. I live with my husband and business partner, Bob, and our three kids: Neve, 10; Shepard, 7; and Sebastian, 9 months. Where do you live and how'd you end up there? What do you love about your neighborhood? We live just north of San Francisco in Marin County. Our town is San Anselmo, a small town nestled in hills with a quaint downtown and an incredible community. We came to SF from Charleston, South Carolina for a job my husband took in the city. We had little time to find our spot. Our children are able to walk to friends' houses, home from school, to downtown for an ice cream all with friends and walkie talkies, feeling safe and knowing every third person they pass. This is huge for the life we want our kids to experience. Combine this with incredible public schools and the magic of West Marin — beaches, surf, hills, mountains, redwood groves, farms...Nature at its best — and you will be hard-pressed to find something better. Oh, and we are less than 30 miles from wine country. Is there a fun story or history behind your home? We won the home lottery with this house. The house, until us, was the same owner since the late '50s. The bones of the home are so incredibly great and we can't wait to change it into ours over the next few years. If you could use three words to describe your personality, what would they be? And how would you describe your abode? I would say it has a very midcentury, bohemian beach vibe. "We find [vintage] treasures and end up combining them with some Ikea. That is just where we are in life." We love to find pieces that have a history, a story, where we get to add to that story by buying them and using in our lives. So, we do a lot of flea markets and vintage stores. We also love Elsie Green in Concord as well as Mid Century Humboldt. We find treasures in both places and end up combining those treasures with some Ikea. That is just where we are in life. What kinds of items do you love to surround yourself with? We like few items but meaningful items. We want everything to have a function and love different textures and pops of color in a neutral way. A lot of lounge areas and seating is what we like to create. How do those things identify with your personality? This is an interesting question. I have never thought about this but man, is this interesting. I get anxious when things are cluttered or we have too much, hence the minimal feel. I also get anxious when not around nature so we love to incorporate plants when we can and are still learning how to do this. It all goes hand in hand in our home — I like to feel bare, calm, and inspired. Our living room or sun room. Those rooms back into each other and are bathed in sunlight with views to our outdoor space. They make me feel incredibly happy. The mirrors that were my grandmother's. I hold onto very little, to a fault, but these gorgeous mirrors travel with us no matter where we move. They are incredibly meaningful to me. Oh man. We use all of our home but I would say the sun room or our bedroom. We do a lot of cuddling in our home and the sun room has an amazing full wall daybed. The bedroom has a king bed that fits our family of five. How have you translated your aesthetic into your child’s room? Our kids' room is actually the space I relate to least. Ha! Our two older kids share a room and we try to let them have creative control of their space, believing this is important in their growth. With that being said, however, it is not my style and too cluttered for my liking! It is hard for me to not go in there and style it the way I would want to. What is your favorite thing about your child’s room? That their rooms represent them so well. They exude their personalities and it is lovely. What's one of your favorite items in your kids' room? I love the chest of drawers I scored on Craigslist that we use as a changing table. It fit our room perfectly and has incredible details. Is there a ritual that you have that you share with your children? We eat dinner at our table every night together. Once a week we go out. But always together. This is very important to my husband and me. We also all pile in one bed every morning for cuddle time. Usually that lasts only 10 minutes as we are all needing to get ready to be somewhere but I love that we stop for a moment and cuddle. It is funny because if we are having a particularly crazy morning and can't, we all feel really out of sorts. It is the place we rest our head every night. The place we break bread with those we love. The place we cuddle as a family in the mornings. It means everything to us. Follow Kris at @neveandhawk and shop Neve & Hawk online here.